An autonomous driving mode that will take some of the strain off of drivers during long trips should arrive in Tesla cars in the next few weeks. Earlier this year, CEO Elon Musk promised the feature as part of a "summer" update, and while Tesla will miss that deadline by a couple of weeks, it is about to roll it out. The company has been testing the software for several months on long drives, including from its Silicon Valley headquarters to Seattle. It keeps the car safely in lane and adjusts its speed to allow for other vehicles, akin to an autopilot for the car. Describing the system in March, Musk said it relied on ultrasonic sensors that cover the area around the car to a distance of about 5 meters, as well as a forward camera and radar. 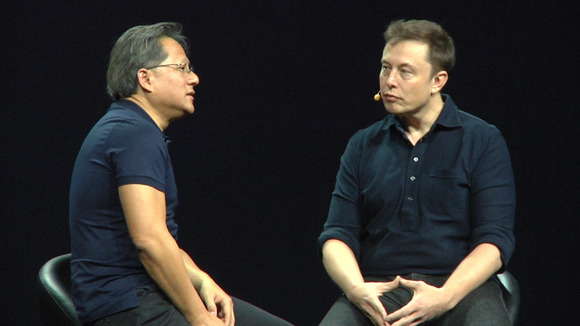 Nvidia chief executive Jen-Hsun Huang interviews Tesla Motors founder Elon Musk at the Nvidia GPU Technology Conference 2015. The software will be rolled out as an update to Tesla cars in the next few weeks, Musk said late last week in an interview with Danish financial newspaper Børsen. "We're probably only a month away from having autonomous driving, at least for highways and for relatively simple roads," he said. Asked about the more ambitious goal of fully autonomous vehicles, Musk said he thinks that technology is still one to three years away, and that regulations could hold it up by a further one to three years.